The most talked about Vietnam's coffee is the Weasel Coffee, a combination of natural and man-made ​​processed products. Mountain plateau in Vietnam, there is a special smart and clever "mink". It is the most favorite to pick the ripe coffee cherry. Every coffee season, male mink inspectors are often the first to select the target in the early morning and will bring their family came to pick the target food in the evening. There are about two to three hours for them to pick fresh coffee cherry every time. When the second hour, it began to excrete the coffee grains that they can not digest. Until the next day, the coffee farmers find by experience, collect their excretion out of the coffee grains, to be washed, dried. Our weasel coffee bean was processed naturally by the animals. We do the drying process naturally by sun drying and ready to be sold. The resulting coffee is said to be like no other. It has a rich, heavy flavor with hints of caramel or chocolate. The body is almost syrupy and it’s very smooth. You would not dare to add milk or sugar to this coffee-it would compete with the bean’s natural sweetness, and distinct flavors and aromas. Because this coffee with the combination of "mink" digestive enzymes, thus made ​​the "weasel coffee" is a unique and without any kind of coffee products can be compared of. 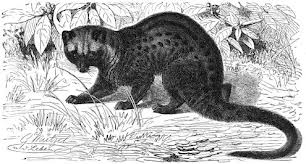 Weasel Coffee due to its special manufacturing process, yield rare and expensive, so it and the civet coffee of Indonesia together are considered one of the world's top coffee.